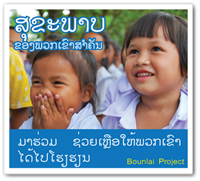 You can help improve education in the rural area of Laos and help disadvantage children hope for a better future. By supporting EDF-Lao, together we will be able to meet the needs of the children and improve the education in Laos more efficiently and effectively as well as increase impact. Supporters can be with individuals, corporations, organizations, foundations or businesses. EDF-Lao embraces all opportunities to form collaborative partnership to help raise awareness of our mission. EDF-Lao has implemented many different projects with each project aiming 100% in helping the disadvantage children receive the education they deserve. At EDF-Lao, there are many ways to contribute. Supporters of EDF-Lao usually do so by financial support, campaigning via their websites and fundraising on EDF-Laos behalf. EDF-Lao welcomes your partnership and appreciate your support in improving equity, access and quality education at all levels to better our children’s future. Honda New Chip Xeng Co., Ltd.